Who are the parties involved in import customs clearance formalities in Rwanda? What is the customs process in Rwanda to import? How is import cargo released from Rwanda Customs to importer? Import cargo clearance in Rwanda Customs. 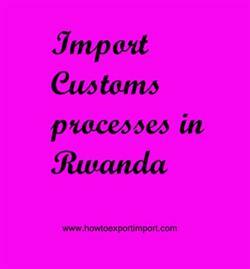 The information provided here details on how to import goods to Rwanda especially import customs clearance procedures in Rwanda. The Customs Services Department under the Rwanda Revenue Authority has the primary function of collecting and accounting for import duties and taxes on imports and manages inflow and outflow of goods in Rwanda. Import customs procedures required in Kigali. Import Customs process in Kigali. Process to import to Kigali. Requirements of customs to import to Kigali. Customs requirements in Kigali to import. Customs needed to import to Kigali. How can I clear customs to import in Kigali. What Customs formalities required to import in Kigali. What should I do to import goods in Kigali. How to get import customs permission in Kigali. Procedure to get customs clearance to import in Kigali. Are two shipments of different buyers permitted to put together to one country.